Power quality analyzer / for electrical networks - MC 784 - Iskra d.d. 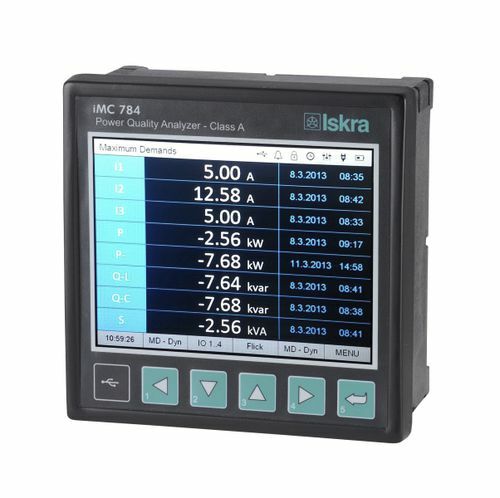 The MC784 Advanced Power Quality Analyser can be used as a standalone PQ monitoring device for detection and analysis of local PQ deviations, transients, alarms and periodic measurements. For this purpose it is normally positioned at the point-of-common-coupling (PCC) of industrial and commercial energy consumers to monitor quality of delivered electric energy or at medium or low voltage feeders to monitor, detect and record possible disturbances caused by operation of consumers. Identifying relevant fixed measuring points is the most important task prior to complete system installation. The implementation of a PQ system itself will not prevent disturbances in network but rather help diagnose their origins and effects by comparing and scrutinizing data from multiple time synchronized measurement points.